After their 0-0 draw in Ancona, the Azzurrini needed an exploit… and they delivered. Casiraghi can really be proud of his boys tonight, as Italy’s U-21 team travelled to Tel-Aviv and defeated Israel U-21 with a score of 3-1, courtesy of a Balotelli double and a cherry on the cake by Abate. A really wonderful performance, in which the outcome of the game was never in doubt for a single second, thanks to the immediate “we’re in charge” attitude of the boys in blue (wearing white for the occasion). And speaking of Balotelli, how ironic that in a day when the Azzurrini were missing important pieces like Dessena, Giovinco, Marchisio and Andreolli, the missing link turned out to a player who, not longer than two months ago, was not even considered eligible. A beast and the indiscussed leader of the Italian team tonight, TurboMario took the Azzurrini by hand and unleashed his goalscoring power, as indeed there is no better word to describe Balotelli’s executions landing into the back of the Israeli net. Sixteen years after their 1992 triumph, which proclaimed Italy U-21 European Champions for the very first time, the Azzurrini will be returning to Sweden trying to emulate the performance of Cesare Maldini’s boys. Hallå Sverige! (From KwSport and Gazzetta): With 4 key players missing (Giovinco, Marchisio, Dessena suspended, Andreolli injured), Azzurrini manager Pierluigi Casiraghi had a clear message for his starters on Wednesday: be aggressive, limit the opponents’ space, and above all, sacrifice. Instructions the Azzurrini immediately followed to the letter, starting with Mario Balotelli. Indeed, it took only 7 minutes for the Inter Milan youngster to break the ice, delivering an incredible 35m free-kick into the top-left corner of Levita’s goal. 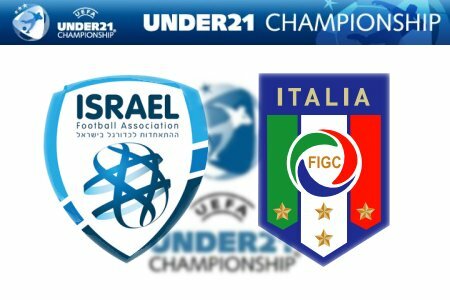 What better way to put Italy on a downhill slope, although to be honest things had started going well since the very first kick-off, with Cigarini (another 35m free-kick) and Lanzafame (volley) putting the Israeli goalkeeper on full alert. Evidently, not alert enough. 1-0 Italy. Far from being content of their early lead, the Italians continued their assaults forward. Everything was working perfectly among Azzurrini ranks, with Balotelli being a constant reference point in the middle and Abate an unmarkable speed demon down the right wing. It was precisely through the Torino winger’s cross that Lanzafame almost made it two in the 14th, narrowly missing the header in front of Israel’s net. 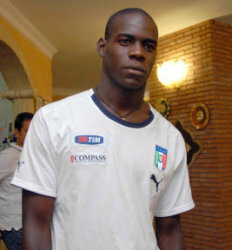 Where Lanzafame had failed, Balotelli did not however. 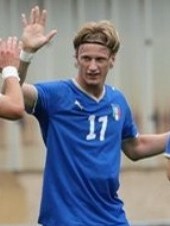 Receiving another good pass by Abate, the Inter Milan forward unleashed a ripping daisy-cutter from the edge of the box, leaving Levita no chance and putting the Azzurrini ahead by two. Great goal, and 2-0 Italy. The music didn’t change much in the second period, because just under two minutes after kick-off the Italians were attacking again, hitting the post with a Davide Lanzafame header (exploiting a great crossing delivery by Balotelli). Almost unmissable from that distance, as Italy continued to push forward and narrowly missed the crossbar with Morosini. Then, a possible lifeline appeared for the home team: in the 55th, a Criscito foul on Avidor resulted in a penalty-kick for Israel, and even though Andrea Consigli hypnotized Toto Tamuz from the spot, he could do nothing on the following winning tap-in. 2-1. It was a goal the Iraelis probably didn’t deserve, but one that gave the home team to try and turn this game around. With their entire team pushed forward however, it was unavoidable that some good counter-attacks would result for Italy. On one of these, Ignazio Abate recovered the ball after a cleared Israel corner-kick, and flew towards the opposing net, beating Levita for the third time after a near-50m run from the half-line. 3-1 Italy and game over. Pack your bags boys, we are going to Sweden! 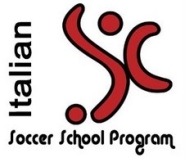 GOALSCORERS: 4’, 25’ Balotelli (It), 55’ Tamuz (Is), 74’ Abate (It). ISRAEL (4-2-3-1): Levita – Kende, Gan, Roash, Tchekol – Cohen, Yeini (58’ Natcho) – Assulin, Refaelov (46’ Ben Haim), Abuhatzeira (46’ Avidor) – Tamuz. (bench: Nitzan, Kozokin, Maymon, Peretz.). Coach: Moti. ITALY (4-3-2-1): Consigli – Motta, Marzoratti, Criscito, De Ceglie – Morosini, Cigarini, Candreva (60’ Bolzoni) – Abate, Lanzafame (89’ F.Pisano) – Balotelli (66’ Osvaldo). (bench: Sirigu, Bocchetti, Di Gennaro, Acquafresca). Coach: Casiraghi. This entry was posted on Wednesday, October 15th, 2008 at 7:37 pm	and is filed under Miscellaneous. You can follow any responses to this entry through the RSS 2.0 feed. Both comments and pings are currently closed.